There is one axiom that if your parents don’t pass away young in life, you are going to watch them age. Now for the most part, this is a natural and nice part of life because mom and dad can slowly become grandma and grandpa which are nice roles for them after working so hard to raise you. But a corollary to that axiom is that if mom and dad are going to age, at some point you are going to begin helping them with the daily affairs of life. 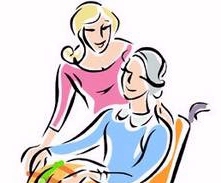 And that occasional helping will escalate as their needs grow until you will become a full-fledged caregiver for an elderly person. For many, the time when you suddenly become a caregiver is just that – sudden. It happens often after the death of a parent and the widowed parent suddenly becomes needy because of the loss they are experiencing. For married couples who have been together for decades, that loss is equivalent to the loss of a limb and far more devastating so that may be the time when you suddenly go from having few concerns for your aging parent to having many. It might be strange to look at it this way, but the more you can ease into care giving, the more time you have to get used to it, for your elderly parent or parents to get used to it and for your family, for friends and coworkers to get used to it. And if you can step in and make some minor changes to the environment of your aging parent, you may be able to delay the time when they become very dependent on you. - Create a lifestyle that is all on one level. Stairs can become a hazard for an elderly person. So early in your plans to adapt their living space, move them into a ground floor bedroom and put all significant rooms, including the kitchen, the pantry, the laundry room and the living room on the same level. - Take some of the work out of daily chores. Some local grocery stores will deliver food to the elderly so you can make those arrangements for your aging parent. You can also find services that work by the hour that come in and clean the house, do simple repairs and chores and take care of the business of home ownership for your parents. - You can make arrangements with home health care professionals to drop by for an hour or two a week just to make sure your parents medications are still safe to use, that all prescriptions have been filled and that your parent understands their medications and when and how to take them. - Reorganize the kitchen so things your parent will use every day are on an eye level shelf and are easy to get to and to put away after washing. Make sure the toaster oven, microwave and other important appliances are also easy to get to and that your parent is comfortable with these units if the models that may have come with the assisted living center are not familiar to them. - Go through the house and make it easy for your parent to use. You can put in those walking and grab bars along the halls and in the bathtub and other places where your mom or dad might need the additional support. You can check the lights so there is plenty of visibility for what your parents have to do. To really take the preparation of your parent’s living space for their ease of use and safety, look at putting emergency pull ropes in every room. These units are used extensively in assisted care units and they make it possible for your parent to pull that cord if she is in trouble and set off an alarm or call to you or to emergency care, should there be a sudden medical need. By working to make your parent’s work area easy to use and safe, you can do a lot to put off the time when your mom or dad may have to move to a retirement village or nursing home. And you keep them independent which allows you to slowly ease into care giving which is much easier on everybody.